Chilli Cheese Toast (or Chilli Cheese Sandwich as it is known in some places) is a very popular and quick breakfast/snack item that is popular with kids and adults alike. This can be made with regular bread slices, buns and can be toasted or left as it is. 1. Mix the cheese, onions, green chillies, pepper powder and little salt in a bowl. 2. Spread butter on half of the bread slices. 3. Spread some of the cheese-onion-green chillies mixture evenly on top. 4. Cover with the remaining slices. 5. Heat a toaster/sandwich maker for 45 seconds. 6. Place the prepared bread slices and cook until set. 7. Alternately, heat a tawa over medium flame. 8. Add little butter and place the prepared bread on top. 9. Cover with a lid and cook on both sides until lightly browned and cheese has melted. Note: In some places, onions are not used and readymade cheese slices are used. You can also use cheese slices instead of grated cheese. 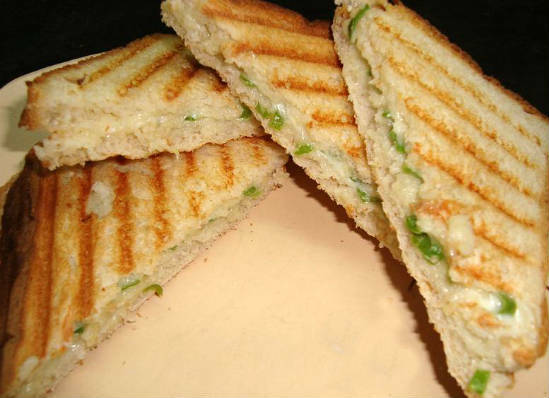 Place one cheese slice on a bread slice, sprinkle some of the green chillies, pepper powder and salt on top. Feel free to comment or share your thoughts on this Chilli Cheese Toast Recipe from Awesome Cuisine.